ACTOR United States who is also retired Marine marine R Lee Ermey is famous for his role as Sergeant Hartman in Full Metal Jacket film died at the age of 74 years. Ermey's manager Bill Rogin said the Golden Globe-nominated actor died of complications of pneumonia. "With great sorrow, I informed that R Lee Ermey died this morning due to complications of pneumonia," Rogin said via Twitter. "We will miss him, Semper Fi," he added referring to the motto of the United States marines. Ermey served as a marine between 1961 and 1971 when he was forced to retire due to injury. 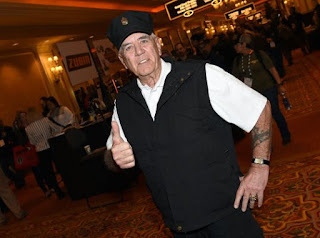 Born in Empria, Kansas in 1944, Ermey earned his first role while studying drama at the University of Manila, Philippines in the movie Apocalypse Now. He has starred in about 60 films, majority in the role of military personnel. Ermey also lent his voice to a number of films such as Toy Story and The Simpsons. 0 Response to "Full Metal Jacket Stars Close Age"